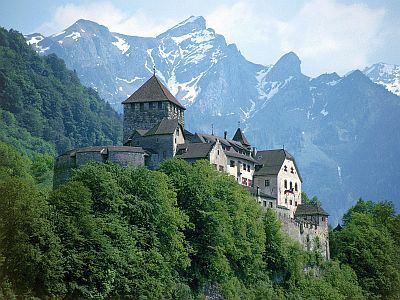 The climate of Liechtenstein is continental at low altitude, while it's Alpine in the mountains. Liechtenstein is a small country, covering an area of 160 square kilometers (60 square miles) and located between Austria and Switzerland. The capital, Vaduz, is situated in the Rhine Valley, at 450 meters (1,450 ft) above sea level. The eastern part of the country is mountainous, and the highest peak is Grauspitz, 2,600 meters (8,500 ft) high. In Vaduz and in the valley, the climate is continental, cold in winter, with a daily average temperature in January around freezing (0 °C or 32 °F), and relatively warm in summer, with a maximum average around 24/25 °C (75/76 °F) in July and August. Here are the average temperatures of Vaduz. In winter, from December to February, cloudy and dull days are frequent, accompanied with rain or snow, typically light but continuous. Sometimes, while in the valley the sky is overcast, in the high mountains the sun shines. On the other hand, outbreaks of polar air masses of Siberian origin can bring glacial weather, with temperatures below freezing even during the day. During summer, from June to August, in periods of good weather there can be hot temperatures in the valley, which can be interrupted in the afternoon or evening by thunderstorms, sometimes intense. The Föhn, the southern wind, warm and dry, coming down from the mountains, is more frequent in autumn, and can lead to sudden increases in temperature. The average annual precipitation in Vaduz is around 950 millimeters (37.5 inches), with a maximum due to thunderstorms from July to September. In the other months of the year, the rains are quite frequent, brought by Atlantic fronts, but they are rarely abundant. In winter, precipitation often occurs in the form of snow. Here is the average precipitation in Vaduz. In high mountains, where the climate is colder and windier, snowfalls can occur for a longer period, depending on altitude. In the mountains, precipitation too is more abundant and exceeds 2,000 mm (80 in) per year: the abundant winter snowfalls are replaced by the strong summer thunderstorms. The sun in Liechtenstein is rarely seen from November to February, especially in the valley; in summer, it shines a little more often, especially in the morning, while in the afternoon thunderclouds can develop even in good weather. The best time to visit Liechtenstein runs from mid-May to late September, when the weather is mild or pleasantly warm during the day, but cool at night in the valley (and even cold in the mountains); there can be some cool and rainy days, and afternoon thunderstorms are frequent, especially in the mountains. In winter: bring warm clothes, a hat, a down jacket, a scarf, gloves, a raincoat or umbrella. In summer: bring clothes for spring and autumn, a T-shirt, but also long pants, a jacket, a sweatshirt or sweater for the evening and for cooler days; a raincoat or umbrella. For the mountains, a sweater, a jacket, hiking shoes, sunscreen and sunglasses.